As the deadly Ebola epidemic continues to wreck havoc on West African countries, the Lagos state government on Sunday stepped up its surveillance to ensure infected nationals of affected countries sneak into Nigeria. Officials of Lagos State Ministry of Health and the Federal Government visited the General Overseer of the Synagogue Church of All Nations (SCOAN), Prophet Temitope Joshua seeking his cooperation in ensuring Ebola victims are not brought to his church for healing. 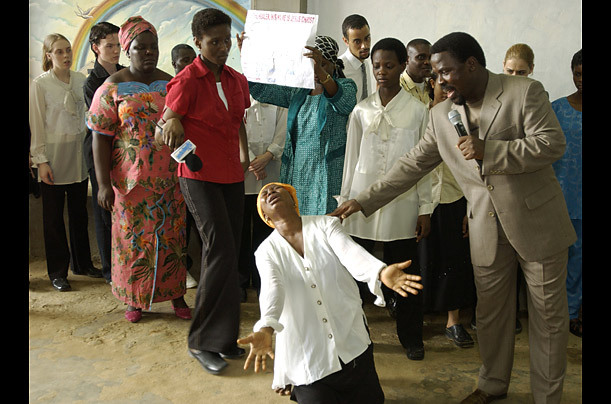 The SCOAN, a popular international church reputed for its claims of divine healing is a popular destination for sick people all over the world including the West African countries currently battling the Ebola epidemic. Lagos State Commissioner for Health, Dr. Jide Idris, who led the delegation to the SCOAN, said the visit was in recognition that the church is an international Christian congregation whose members comprise of people from all over the world including the countries of West African sub-region already affected by the disease. The commissioner added that the visit is one of the state government’s strategies of sensitizing faith-based organizations on the need to cooperate with the government to prevent the spread of the disease in the country by educating the worshippers to report health issues to medical experts. Idris said the Federal and Lagos state government are working hard to prevent a spread of the virus into the country, the delegation has deemed it fit to educate and create awareness among the multinational congregation on the disease and how it can spread. “We have our strategies that we intend to share with you. Again, we need to know the resources you have here because whether it is one or two cases, if they are allowed to get out, it is a major problem. We are here to work together on how to contain this disease,” Idris told the cleric. Another member of the delegation and Director, Centre for Disease Control (CDC), Professor Abdulsalami Nasidi said the visit was to inform the Synagogue church leadership about the deadliness of the Ebola virus and to ensure that it does not escape into the country. Nasidi, who is both an Epidemiologist and Virologist, said the meeting is a “positive engagement mission” saying the team is seeking the cooperation of the church in containing the virus. “We are here to engage you positively, we know the powers of this House and your powers and we are duty- bound to protect you and your congregation. We have no doubt the power God has given you, we can’t do that, but we want to help and make it work stronger,” he said.